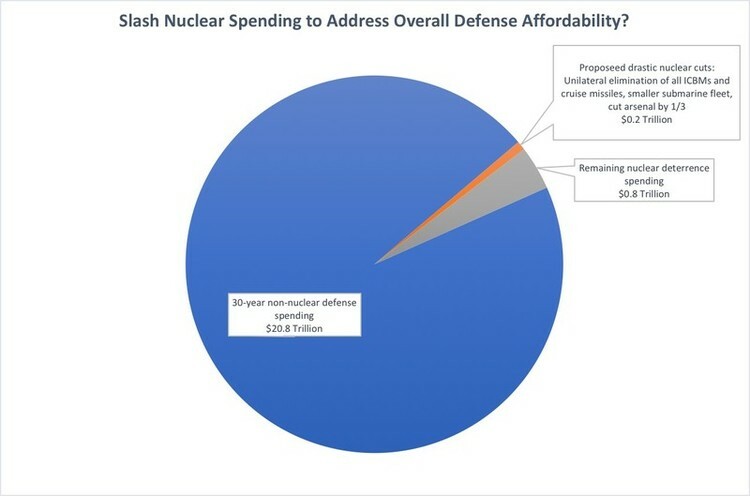 The second reason why even steep nuclear cuts have only a marginal impact on overall defense spending is that the bulk of projected nuclear spending is the fixed cost of maintaining deterrence, rather than the cost of modernizing or replacing aging weapons. More than two-thirds of the total goes to maintaining deployed weapons, infrastructure, early warning systems, and the command and control systems necessary for a deterrence force to remain viable. Specifically, CBO found that developing and buying replacement weapons accounts for $0.399 trillion out of its estimated $1.242 trillion 30-year total. CBO’s numbers are somewhat inflated because they include the entire cost of the Air Force’s next-generation stealth bomber, even though adding nuclear capability only accounts for a few percent of the bomber cost. Furthermore, as Deputy Assistant Secretary of Defense Robert Soofer explained, “the planned size of the bomber force is determined entirely by its conventional mission,” so eliminating the nuclear role would not mean buying fewer aircraft. Including a notional 5% of the bomber cost (though an even lower fraction of 3% might be more realistic) would change CBO’s numbers to $0.989 trillion, and modernization costs to $0.307 trillion. This agrees with the $230-290 billion range that Soofer provided for projected DoD nuclear modernization spending over the years 2018-2040, after accounting for differences between what the two projections include. Namely, the DoD estimate includes the cost of modernizing nuclear command, control, and communications systems but excludes the Department of Energy’s warhead life extension programs, and the replacement submarine-launched ballistic missile (SLBM) falls mostly outside the DoD’s 23-year window (for these latter two elements, CBO included $63 billion and $45 billion, respectively). In other words, it costs money for America to remain one of the world’s nuclear weapon states. And since many of these baseline capabilities, like the weapons themselves, have aged to the point that they must either be replaced or lost, even dramatically scaling back nuclear force structure only really touches a fraction of that one-third of nuclear spending that is allotted to upgrades and replacements. Most of the options CBO analyzed for changing the modernization plan could only reduce nuclear spending by a few percent. Even the most dramatic cuts only reduced long-term nuclear spending by about 10%, and these required eliminating a leg of the triad. Unfortunately, though the CBO report is clear that the bulk of its trillion-dollar estimate is the cost of simply maintaining a U.S. nuclear deterrent, this critical detail is very often misunderstood or ignored. The trillion dollar figure is repeatedly mischaracterized as the cost of building new or replacement systems. See, for example, here, and here, and here. Even a former Secretary of Defense and a former Commander of U.S. Strategic Command made this mistake. These mischaracterizations create misconceptions about the extent to which adjusting modernization plans can save money. There is a vigorous and worthwhile debate underway about whether changes to U.S. nuclear posture would weaken or strengthen U.S. security. CBO concluded that the cuts outlined above would increase America’s vulnerability to a disarming first strike by reducing the number of locations an adversary would have to target by more than two thirds, and by reducing the number of U.S. weapons available for a counterattack. CBO also found that these changes would substantially reduce U.S. capabilities for responding rapidly to an attack and capabilities for responding in kind to more limited nuclear attacks. The CBO report understates some deleterious effects of proposed cuts to America’s nuclear deterrent and omits other likely effects from consideration. In particular, unilateral reductions of this type would sacrifice leverage for future negotiations aimed at reducing or constraining Russia’s strategic arsenal. This is precisely what happened when unilateral U.S. reductions of nonstrategic nuclear weapons left America unable to convince Russia to reduce its nonstrategic nuclear arsenal, which according to the latest Nuclear Posture Review numbers in the thousands and is growing. These changes would leave the U.S. deterrent falling even further behind Russia’s in both numbers and diversity, moving America closer instead to nuclear parity with China. Overall defense affordability is a poor surrogate for substantive policy and strategy debates, even if a convenient one. It’s distracting at best, and disingenuous at worst. Instead of rushing to the conclusion that America must cut nuclear modernization to address problems of overall defense spending, those concerned should first suggest how much the country can afford to spend on defense over the long term. For anyone who believes the United States cannot afford to spend anywhere near $21 trillion over 30 years on defense, it makes no sense to focus on something like nuclear deterrence spending, which in that case cannot address the real issue in any meaningful way. If defense spending is too high, or the national debt is on track to become unmanageable, then Americans must face the reality that nuclear deterrence spending is not the problem and cutting it cannot provide the solution. Dr. Aaron Miles is a Fellow at the Center for Global Security Research at Lawrence Livermore National Laboratory. He served previously as a Senior Policy Advisor on Nuclear Deterrence in the Office of the Secretary of Defense. His policy interests include nuclear strategy, strategic stability, arms control, and disarmament.